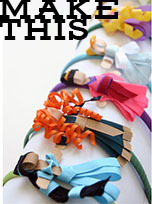 Grosgrain: Costumes for the needle and thread challenged. Costumes for the needle and thread challenged. I know some of you may be sewing challenged and for you this time of year is no picnic. 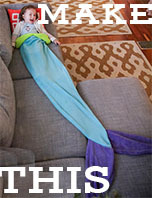 Martha Stewart has the BEST no sew costume ideas. They're so great I want to try some but the sewing snob in me says no. I need to tell him to get off his high horse. Here are my seven favorites from her site. Beneath these majestic cloaks are ribbon sashes decorated with button-and-ribbon medals. The unlined capes don't require any sewing, just fabric glue to hold the rickrack in place. 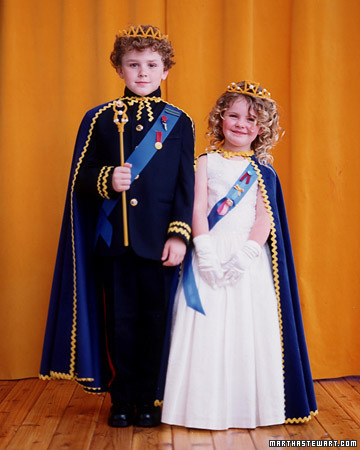 A fancy dress is the underpinning of a girl's costume. 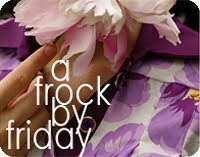 A boy's jacket, its collar turned up, is embellished with bright buttons and tacked-on rickrack at the cuffs. Tacked-on red ribbon runs down each trouser leg. 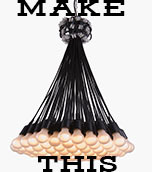 Read the Martha Stewart Tutorial here! Oh my goodness, if this doesn't tickle your no-sew fancy I just don't know what will! Why did this baby chicken cross the road? To get to the Halloween party, of course. Her costume is made from two tickly feather boas, ordinary kitchen gloves, yellow tights, and a pilot's cap that's crowned with a felt comb. Under the plumage, two leotards are stuffed with batting for extra plumpness. Appropriate for children ages 3 and older. I couldn't believe this was no sew either. Martha really can make 'em! Or should I say her diligent team of creative minions. This idea is so simple I can't believe I hadn't seen it sooner. Maybe it's just Martha's fabulous photography but this looks SO cool! 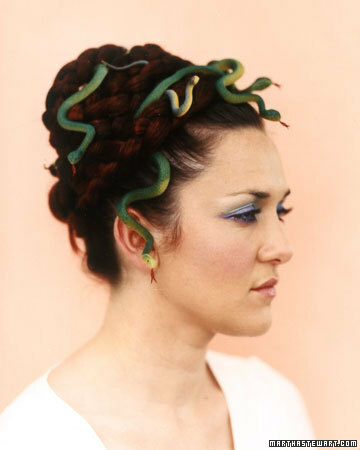 Create squirming braids reminiscent of the mythological reptilian-haired woman. Buy three hair extensions and braid them. If you have long hair, separate it into ponytails and braid them, too. For short hair, just pin up ends. Wrap braids (real and extensions) into a bun; pin, and weave in small snakes. Use bobby pins to secure larger snakes that dangle: Thread a needle with wire and poke it through a snake's underside, and tie wire around a pin; slide pin into hair. Again, Martha's photographers are amazing! It would be my dream job. Crepe paper is inexpensive and available in a rainbow of colors, and it can be tugged, stretched, and rolled into a multitude of shapes. But be careful: it is paper and can rip. Which is why Martha mag used it to create beguiling accessories -- hats, wings, garlands, and skirts -- instead of entire outfits. 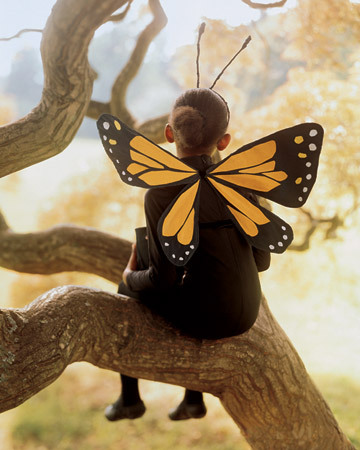 Here, they created a pair of wings to turn any trick-or-treater into the perfect butterfly. An Elizabethan-style costume like this could get even Tinkerbell hooked on coffee. Turn 10 to 12 small filters inside out, fold in half, and trim off corners. I saw this photo in a Martha mag many years ago. But I thought it was the neatest idea. The only catch is that your child has to have at least a decent amount of hair to braid. The yellow yarn helps but about enough to fall midway down the back. What to bee? Annabelle, 5, will create a buzz as a bustling hive. 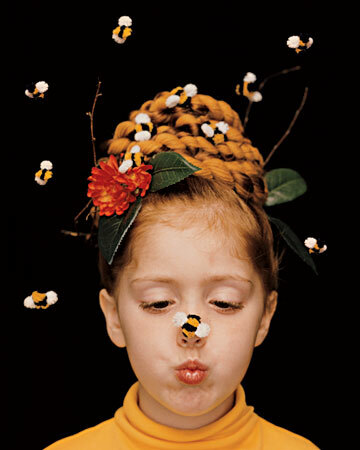 Silk flowers, twigs, and bees all find home, sweet home atop her hair (made longer with twisted yarn). They made the bees with pipe cleaners; chenille bees are available at crafts stores. For this style, hair should be medium to long in length. Knotted black yarn pinned to a white skirt is the perfect foil for a crawling spider baby. Turn each of 3 pairs of men's microfiber black dress socks inside out. Hope this partially satisfies your no-sew Halloween fix. I really wish I could have had more time with this holiday. If I would have planned things better I could have offered so many ideas. Que Sera. There's always next year. those are amazing - thanks for sharing - love the medusa idea! That chicken is SO cute! We have made two of these! 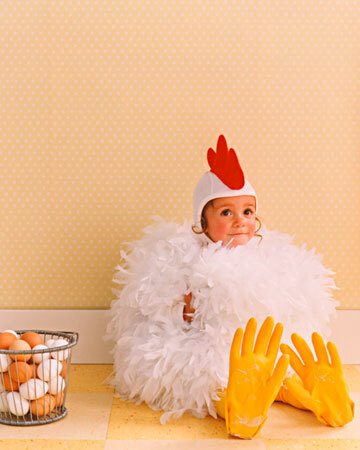 My daughter was the chicken when she was 3 and people just oh and ah-ed over her! When my son was still in a sling, I found a black hip carrier, added the extra arms to it, then painted a white sheet with the spider web. We cut holes in the sheet for my head and the carrier pieces. I put it on and held my arms out to show the whole web. We were "Charley's web" and even one Best Costume at the party. Thanks for sharing these, they bring back great memories!